South African President Cyril Ramaphosa will arrive in Harare tomorrow for the third session of the Zimbabwe-South Africa Bi-National Commission (BNC) that is expected to deepen bilateral relations and broaden mutually beneficial areas of cooperation. The BNC's Heads of State Summit, which will be graced by President Emmerson Mnangagwa and his SA counterpart, takes place on Tuesday. The Sunday Mail understands that six South African ministers – Lindiwe Sisulu (International Relations and Cooperation), Nosiviwe Mapisa Nqakula (Defence and Military Veterans), Rob Davis (Trade and Industry), Siyabonga Cwele (Home Affairs), Blade Nzimande (Transport) and Bogopane Zulu (Deputy Minister for Social Development) – will jet in today. 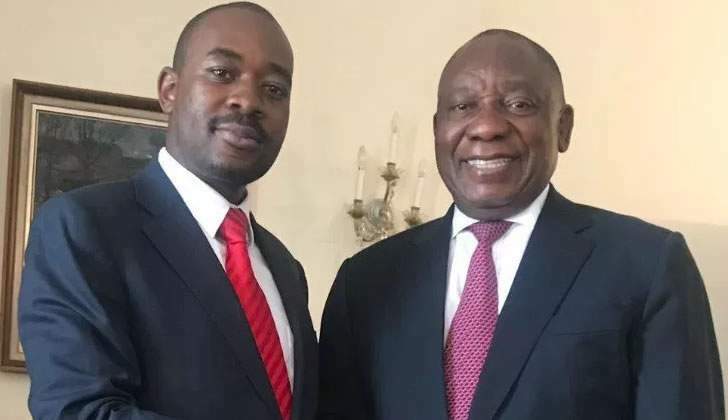 Other ministers are, however, expected to travel to Harare with President Ramaphosa. Zimbabwe is South Africa's biggest trading partner. President Ramaphosa's spokesperson Ms Khusela Diko confirmed his itinerary yesterday and emphasised the extent of the economic relations between the two countries. "Trade cooperation between the two countries is at a high level to the extent that South African exports to Zimbabwe in 2018, amounted to approximately R30,8 billion (about US$2,1 billion), while imports from Zimbabwe amounted to approximately R3,6 billion (US$250 million), thus placing Zimbabwe among South Africa's top trading partners on the continent. Several agreements covering political, economic, social and cultural relations will be signed this week. There are expectations the upgrade of Beitbridge Border Post and the revival of the National Railways of Zimbabwe (NRZ) will get fresh impetus through bilateral engagements between the two sister republics. In his remarks at the same occasion, SA's director-general in the department of International Relations and Cooperation Mr Kgabo Mahoai said the BNC should bring tangible and mutual benefits for people from the two countries. He said the BNC should come up with a "deliverables that are realistic, achievable, time-bound and with potential to impact on the livelihoods of our people". According to draft agenda minutes of the BNC seen by The Sunday Mail, deliberations will be anchored on four thematic committees, which are political and diplomatic; economic; social as well as defence and security. Most importantly, the economic committee will deliberate on "financial cooperation, arrears clearance roadmap, non-financial cooperation and customs matters". Discussions will also centre on the "implementation of the Joint Water Commission projects, cooperation in the energy sector, cooperation between regulatory authorities, cooperation in natural gas, bio-fuels and petroleum fuel marking". Further, officials will also focus on construction of the Mozambique-Zimbabwe-South Africa power transmission line that is expected to improve connectivity and electricity trading in Southern Africa. Agenda minutes also show that Harare and Pretoria will discuss "South African permits for Zimbabweans, Zimbabwe Exemption Permits, Dispensation for Zimbabwe Programme, cross-border migration of unaccompanied minors". Most importantly, sanctions imposed on Zimbabwe by the United States of America and the European Union (EU) bloc, which have had deleterious effects on the country, will also come under scrutiny. A fortnight ago, South Africa's International Relations and Cooperation Minister Lindiwe Sisulu confirmed that one of the main issues on the agenda for this year's BNC would be sanctions imposed on Zimbabwe by the West. At the last BNC held in Pretoria in 2017, the two countries signed five agreements for cross-border trading cooperation, energy, environment, information communication technologies (ICT) and sports and recreation.